Sunscreen: BB cream (Dr. Jart Premium BB SPF 45 in winter & Guerlain Lingerie de Peau SPF30 in summer) when staying out of the sun; If entering possible sun exposure, then anything Clarins/Shiseido SPF 50 & up! M’s skincare routine is similar to mine so of course I’d give her a good grade! 😛 And I can assure you all that her skin is lovely. Cleansing: double cleansing, since I don’t wear make-up (i.e. mascara and eyeliners) I don’t use any make-up remover prior to the oil cleansing step. On the day I wear make-up, I just use the sample size Lancome Bi-Facil to remove mascara first . My cleansing oil is The Face Shop Deep Firming Cleansing Oil. it’s okay, I plan to change it, I have just a tiny bit left. What should I use? For foaming cleanser, I use Cerave, almost finish my first bottle. Toner: I use St Ives Face Cars Pads, Exfoliating Pads with mild AHA interchargeable with the mist you gave me from Reviva Labs Facial Spray Rosewater. Serum: I tried the Benton Snail Bee High Content Essence interchargeable with the Estee Lauder Advanced Night Repair Recovery Complex. Nothing wow here. I plan to follow your footstep once these two bottles are finished. Oil/Moisturizer: I use pure argan oil from Divine Essence at the health food store (much cheaper than other brands at Sephora or online) or the same line Benton Snail Bee High Content Steam Cream. I am ok with both, though nothing as amazing. I think I will continue with the argan oil, but need a moisturizer, what do you think about the super luxury brand Sulwhasoo Concentrated Ginseng Renewing Cream? Masks/treatment: once a week, on lazy Sunday I would do a mini facial, and finish off with a Korean moisturizer mask sheet, any brand would do. Any reco? Sometimes I would do a deep exfoliating by Skin Food Black Sugar Mask wash off, or Origins Clear Improvement Charcoal Mask. Really, anything, I want to experiment. I do have to say that I feel as though I had a hand in molding P’s skincare routine! 😀 A gap I see is: no cleansing in the mornings. I know you don’t wear a lot of makeup but I still think something like a micellar water or a non-foaming cleanser would be a good skin prep step to rid of sebum build-up and residue skincare from the evening. I recommend the Yves Rocher micellar water or Spectro Cleanser for Combination skin. You asked for another kind of cleansing oil to try at night – I really enjoyed Kose Softymo Deep Cleansing Oil which is quite inexpensive. Regarding the question about whether to use Paula’s Choice AHA with the St Ives Exfoliating pads – on the nights you use PC AHA, skip the pads and just use the Reviva Labs facial spray. I know P is really into Asian skincare and pH level is critical to her (I’m guessing you’ve been reading the reddit Asian Beauty subforum, hence the slew of Benton products!). I think there are diminishing returns on ultra luxury brands like Sulwhasoo. Any single skincare product that costs $200+ isn’t going to give you twice, or 4 times as good result as something in the $100 to $50 price range. The key ingredients in the Sulwhasoo Concentrated Ginseng Renewing Cream – aside from panax ginseng root extract – are: glycerin, squalane, and glycol. These basic ingredients can be found in many, much less expensive moisturizers. And, I’m just not convinced of the skincare benefits of panax ginseng root extract as a topical treatment – there might be some anti-oxidant properties, but not enough to justify the price tag. If you’re still curious about trying something with ginseng, give Ole Henriksen Truth Crème Advanced Hydration a try. I’m no authority on sheet masks – I mainly use ones with hyaluronic acid and they all tend to hydrate and plump my skin – I focus more on how much serum is in the package and if the mask shape fits my face well. I mentioned in my sheet mask post that I really like the My Melody ones I got from sasa because they’re 3D masks that fit my face snugly. I’ve also heard really good things about Leaders Insolution sheet masks. Note>> (1) I have combination skin – oilier forehead and nose with regular break outs. I have new zits appearing on my face gradually in pre, during, and post period. (2) I experienced even worse breakouts (like, 5-6 zits appearing in a day) when using products specifically made for oily skin, Like Biotherm Purefect range and Kiehl’s Ultra Facial Oil-free and Blue Herbal range, so now I tend them. Proactiv has also made my face slicker. (3) I Live in Indonesia, where the weather is mostly humid and temperature can reach 30゜C during the day. 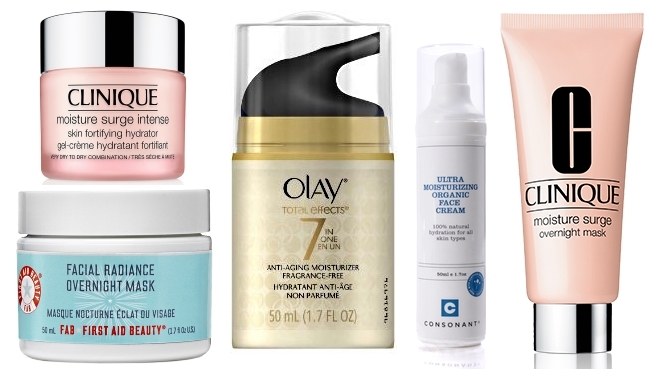 You’re using the correct products for your skin type, which is fantastic. Thanks for introducing me to Juara Skincare – their range looks quite nice! I think that the Bioderma Sebium cleanser in the evening may not be enough to clean off your skin of sunscreen and sebum from the day. I’m a huge advocate of oil cleansing for oily skin types. Have you ever tried oil cleansers? A few to try are The Body Shop Camomile Silky Cleansing Oil, DHC Deep Cleansing Oil, and L’Occitane Shea Cleansing Oil – none of these contain mineral oil just in case you’re sensitive to it. Yes, acne treatment should be used before moisturizer so that it can be in direct contact with the affected skin. Allow the acne treatment to dry and absorb into the skin for about 5 minutes before applying anything else on top. There’s no set rule about eye cream – I typically apply it after my face moisturizer but it should be fine prior. The general guideline is: thinner, more fluid products first: toner/lotion, serums, gels – and then thicker more emollient products on top to seal everything in. Sunscreen goes on last in terms of skincare. You noted that the morning toner is hydrating enough as your moisturizer – I think it would still be beneficial to have a serum or a light moisturizer which acts as a barrier / protectant between your skin and your sunscreen / makeup. I would recommend something light but containing hyaluronic acid – perhaps something like Derma E Hydrating Serum with Hyaluronic Acid. The Clarins sunscreen you’re using only contains Titanium Dioxide (TiO2) as its active sunscreen ingredient which does not provide sufficient coverage of UVA rays (these are the long term damaging rays that promote aging). Zinc Oxide (ZnO) the best mineral suncreen ingredient, and ideally, a sunscreen should contain both TiO2 and ZnO for maximum effectiveness. ZnO has the added benefit of skin healing properties (it is the primary ingredient in diaper rash ointment!). Since you live in a tropical climate, a sunscreen with a SPF of at least 40 is recommended. 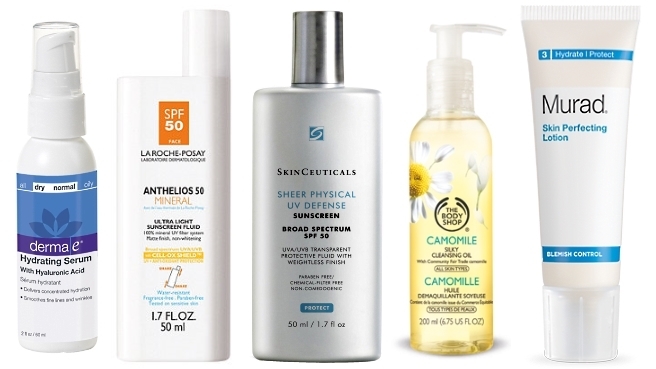 Here are some options that contain both TiO2 and ZnO and are suitable for the face: La Roche-Posay Anthelios SPF 50 Mineral, Avene Mineral Ulta-Light Hydrating Sunscreen Face SPF 50+, and SkinCeuticals Sheer Physical UV Defense SPF 50. You may be allergic to something in those products that broke you out; common skincare ingredients that are irritants include: alcohol, menthol, sodium lauryl sulfate, essential oils like orange oil, etc. Fragrance can also be a major irritant. Be sure to read labels (here’s a handy site) and do a process of elimination – remove one item at a time to isolate the culprit. In the same vein, only try one new product at a time in order to lessen the risk of a reaction, so if a reaction does occur, you know immediately what is causing it. I don’t think the Clarins HydraQuench Cream-Gel is doing your skin any favours, its second ingredient is alcohol. In addition, fragrance is quite high on the ingredient list, and from experience, I do find that Clarins products are overly scented. My recommendation to you is to find something lightweight without alcohol, and if possible, something without fragrance – look for products with these ingredients: glycerin, sodium hyaluronate (hyaluronic acid), glycol, squalane, and vitamin E. One to try is Murad Skin Perfecting Lotion. I’m in the market for a sunscreen for my face — was loosy goosy with it over the weekend and now I’m rashy 😦 Do you have any recs? I usually use Neutrogena Ultra Sheer SPF 60, which works fine on my dry skin, but I wouldn’t mind trying something new! I want to like the Neutrogena stuff but it only contains chemical sunscreens, which I don’t advocate. I wouldn’t even mind if it was a blend of chemical and mineral sunscreen but that Neutrogena one is all chemical. I think a mineral sunscreen would be a better bet for you. And since you’re Canadian, I can recommend Canadian ones to you! Thanks! I’ve liked some of the LRP I’ve tried, so I will definitely check that one out. I should mention that I’ve tested both the LRP and Avene out and the LRP is lovely! It has a tint which is around a MAC NC35 – the colour didn’t stay dark on my skin though. It is super liquidy. The Avene one has a slight white cast and more of a lotion consistency. I think LRP is your best bet. I can imagine it would take a long time, but your efforts are appreciated. Great post. So detailed and informative. 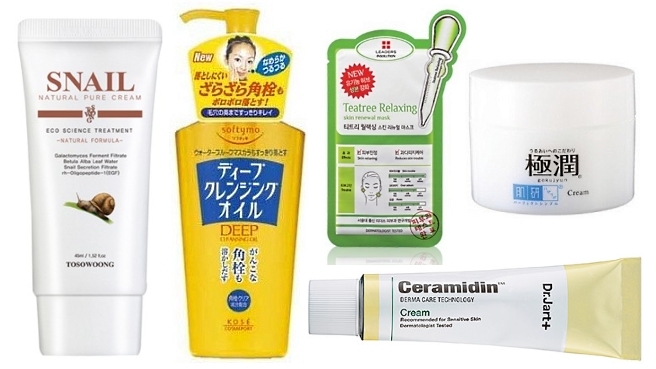 I’m intrigued by the Snail pure cream of the Korean brand .and will check that one out. Thanks for the link, I’ll sure to check this one out. Hats off my fairy godsister! I’m deeply amazed of how wellversed you are in giving recommendation re: skin care concerns. You could really pass for a skin care expert. This is so cool and in depth! I’d love for you to grade my skincare routine. I’m not as happy with it as I have been. I’d like to figure out what I’m doing wrong and why my acne won’t clear up. I love your reviews of skincare routines! It’s great to see a huge variety of what others are using. I feel like they’re overhyped. I just looked up the ingredients of a few of them and they’re really no different than a hydrating serum mixed with film forming ingredients to help “seal” the product onto the skin. You can achieve the same effect by using a serum and then a more emollient moisturizer on top. But I wouldn’t discount them – try one if you’re curious especially the cheaper price point ones (watch out those, some of the gel creams contain alcohol). That Body Shop one has a really neat texture! Great post! I want you to access mine, but I am so scared since I know I will fail. I have sensitive, aging, acne prone, oily skin with a bonus rosacea. Luckily 90% of the year my rosacea does not flare up (or fades wi hours) if I stay away from allergens such as dust and sun, but it is not always possible. Aw, I won’t be harsh! 🙂 It’s more to recommend things than to critique really.